An interesting take on the Desire range that could thrive at a lower price point. You may have been mistaken for thinking that there wasn't really a gap between the HTC One V and the HTC Desire C, but you'd be wrong, as the HTC Desire X forces its way between the two handsets. On paper there's very little to separate the Desire X from the One V, as this new smartphone appears to be an almost carbon copy of its One series brother. You can pick up the Desire X for around £215 SIM-free, while it's also available for free on contracts starting from £20.50 per month. This isn't too similar to the One V, which is actually available of cheaper monthly contracts (starting at £15.50), while SIM-free it's a little dearer at £230. As well as the in-fighting with the One V, the HTC Desire X also has the likes of the Samsung Galaxy S Advance, Galaxy Ace 2, Sony Xperia P and Orange San Diego to contend with in the now crowded middle market of the smartphone world. The main difference from the One V it seems is the design, with the HTC Desire X sporting a look and feel which owners of the flagship HTC One X will be familiar with, however the polycarbonate unibody is out, in favour of a rubberised plastic back which you can peel off. On the front of the Desire X you find the 4-inch, Super LCD display with three touch buttons below it, back, home and multi-tasking, which tells you this handset is packing Android 4.0.4 Ice Cream Sandwich – but you won't find a front-facing camera here. The case slightly juts out below the capacitive buttons, and while not as obvious as the "chin" on the One V and the old school HTC Hero, the lip is noticeable when you run your finger down the phone. The diminutive size of the Desire X - it measures 118.5 x 62.3 x 9.3 mm - means it fits comfortably in the hand, with the rubber coated rear providing a high level of grip, allowing you to keep hold of the phone. Build quality appears solid, but the Desire X weighs just 114g, meaning it's deceptively light, which certainly isn't a bad thing and means you can slip it into a pocket without issue. There's not many physical buttons on the Desire X, with a volume rocker switch located towards the top of the right side and a power/lock setting in a central position on top of the phone. The centralised position of the lock button means reaching it with your thumb is out of the question - your index finger is the digit required to manipulate this key. While easy to hit, those who may be switching from a Samsung device, which have the power/lock key located on the right side for easy thumbing (when held in the right hand), may find this new movement a little alien at first – but you'll quickly get used to it. Also up top is a 3.5mm audio jack, while on the left hand side is a microUSB port for charging and connecting the Desire X to other devices. On the back the 5MP camera and single LED flash are housed in their own oval zone, which evokes the Evo 3D language from a year ago, but fits more slickly into the architecture of the HTC Desire X.
Underneath the back cover there's a relatively average 1,650mAh battery, standard size SIM card slot and a microSD slot which supports cards up to 32GB in size, allowing you to build on the 4GB of internal storage. Getting the rear cover off however is a little challenging, as there's no obvious indentation which encourages you to slip a finger nail in and peel it off. Instead you're left trying to prise your nail between the front and back of the Desire X, and we found the best place is you work your way in at the top. Once you're in you can pull the wafer thin cover off, be careful as it hugs the chin at the bottom of the Desire X, and you'll notice that it feels slightly flimsy. The power/lock button and volume rocker are attached to the rear case and the construction doesn't fill you with confidence once you've taken the cover off, as the thin plastic feels like it could break very easily. We'd advise against taking the back cover off the HTC Desire X too much, but apart from that it's a smart, if uninspired handset which should be able to stand up for itself in the middle of the mobile market. 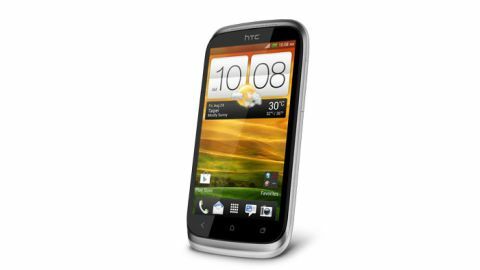 Thanks to Unlocked-Mobiles for getting the HTC Desire X to us in super quick time!